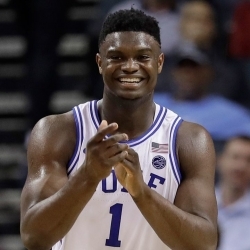 The Duke Blue Devils’ Zion Williamson is the consensus #1 pick to go in the 2019 NBA Draft. One in five adult Americans will bet on the March Madness tournament this year, as NCAA Men’s Tournament brackets are more popular than they have ever been. Reuters said 47 million people will wager a combined $8.5 billion on March Madness, according to the American Gaming Association (AGA). This year, the NCAA Tournament begins on Tuesday, March 19 and ends on Monday, April 8 in Minneapolis. A full 29% of those people will bet on the Duke University Blue Devils to win the NCAA Tournament. Despite Duke being the biggest favorite entering March Madness in years — or perhaps because of it — people continue to put down tremendous cash on who will be in the NCAA Tournament’s Final Four. Since this is the first March Madness to be held after the U.S. Supreme Court legalized sports betting, this will be the first time that sportsbooks in New Jersey, Mississippi, West Virginia, Pennsylvania, and Rhode Island will offer legal wagers on the games. It is also the first time Delaware will have single-game sports bets on March Madness — it had sports lotteries (parlay bets) before. The AGA’s report on sports betting says that more than $5.9 billion has been bet on sports in the eight states which have legal gambling since the SCOTUS decision. Events like the Super Bowl and March Madness collect the lion’s share of the betting. Nevada’s long monopoly on single-game sports bets appears to have cost the state just under 10% of its betting action this year. Nevada gamblers bet $146 million on legal bets on the Super Bowl, which was an 8% drop from the record $159 million wagered last year. Gaming analysts from Eilers & Krejcik estimated that, if all 50 states legalized sportsbooks and mobile sports betting apps, Americans would bet a whopping $15.2 billion on March Madness alone. The likely winnings for sportsbooks would be $1.2 billion. Those numbers could be put to the test in the next four years. The same Las Vegas-based gaming analysis firm estimates that 39 US states will have legal sports betting by March of 2023. This year, the AGA projects that 40 million people will bet $4.6 billion with friends, coworkers, and family members on 149 million March Madness brackets. Take one look at an 2019 NBA Mock Draft and you’ll see why the Blue Devils are such a heavy favorite to win the tournament. In an NBC Sports mock draft, Zion Williamson, RJ Barrett, and Cam Reddish are slated to go 1-2-3 in the NBA Draft this year. Tre Jones, the 6’2″ Freshman point guard, is going 20th overall. Add to that a Hall of Fame coach and Duke simply has everyone outclassed. Plus, Duke’s star players are Freshmen and Sophomores — 18-year old to 20-year old young men. Youth brings its own variables. A slow start, foul trouble, a bad shooting streak in the 2nd half, an opponent who gets hot from the 3-point line — any of these factors could cause a young squad to panic in the biggest games of their lives. Still, the Duke Blue Devils have faced a year of big games and tv spotlight. Most of the squad have been the center of attention in their part of the basketball for much of their childhood. Duke takes only the best, and they expect the best results. That 29% picking Duke against the field might be on to something.